Dreams for a husband and children are relegated to the recesses of her heart, the self-confessed old maid deems it too late. But the near-perfect widower resurrects a smidgen of hope. Only his impenetrable, superstitious religious beliefs stand in the path to her falling head over heels, those and his love for his dead wife. Would there ever be room for her in his heart? And would he give up his fanaticism for God? 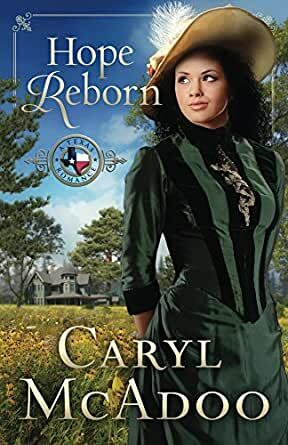 With fourteen titles released by six publishers, Simon & Schuster author Caryl McAdoo is excited about her new historical Christian Texas Romance HOPE REBORN, book three after VOW UNBROKEN (1832 / March 2014), book two HEARTS STOLEN (1844 / September, 2014) She also enjoys success with her new Biblical fiction series The Generations, volume one A LITTLE LOWER THAN THE ANGELS (November 2014) and volume two THEN THE DELUGE COMES releases in March 2015. The novelist also edits, paints, and writes new songs. In 2008, she and her high school sweetheart-husband Ron moved from the DFW area-home for almost fifty years-to the woods of Red River County. Caryl counts four children and fourteen grandsugars life's biggest blessings believing all good things come from God. Praying her story gives God glory, she hopes they books will also minister His love, mercy, and grace to all their readers. Caryl and Ron live in Clarksville, the county seat, in the far northeast corner of the Lone Star State. A bit too descriptive in some passages, for my taste. In others, not enough. Apart from that, like the characters, the story, the way things not always perfect, and the values. Third book in the Texas Romance Series, Hope Reborn continues to follow the Buckmeyer family in Texas. This time they meet May Meriweather, famous romance novelist who has come to Texas to interview Major Baylor and Captain Rusk to fictionalize some of their exploits. Once in Texas however, she meets Henry Buckmeyer and his family and his daughters talk her into starting at the beginning of the love story which begins with Henry and his now-deceased wife Sue. I liked the twists and turns that drew Henry and May together in friendship and romantic attraction and separated them as well. There were some very suspenseful moments with life hanging in the balance. I loved that Henry used the resources that God gave him (his money) to purchase slaves and then grant them their freedom. I think it speaks to the equal value of all humans no matter their colour or race. God once again shows His mercy and grace in taking care of the characters past histories and sins and we also see Him bestow His blessings on various members of the Buckmeyer clan. I appreciated May’s inability to understand why Henry refused to let things go very far between them given their difference in faith. I loved how different she felt once she understood that his faith was not in an imaginary being, but a true and living God. Hope Reborn was an engaging clean historical romance novel to read. It moved along at a good pace and had enough suspense, danger and intrigue in it to hold the interest of most readers. I thought it was a great addition to this series, and I gave it a rating of 5 out of 5 stars. I don't know where to start, I fell in love with this family in the 2nd book (I didn't read the first since it was priced at $15.99, I refuse to pay that much money for a ebook... and that's saying something since I'm a self-publish author myself). I was hopeful that all the things the second book left us hanging on would be resolved... boy was I disappointed. I mean I get it if it picked up right after the book ended or even a few years after, but six years and to not have a story-line or even a mention of the storyline finished. Maybe I missed it, maybe during my late night reading I dozed and completely missed the author finishing Rebecca's, Wallace's and Laura's story??? I mean I know what happens in the book, but I want to know what happened with the one that wasn't chosen! I mean we got a lot of her thoughts in the 2nd book, and then nothing in the 3rd. I think it's sloppy to leave such a big part of your book hanging like that. I felt this book was too rushed, the author put quite a few obstacles in their way and with each one I felt didn't give them enough time to fully portray what was going on. I'm not sure, I just finished it... my thoughts are all over the place as you can see. I think Caryl McAdoo would benefit for some hard and honest beta readers. There were just too many things that in my opinion distracted from the story and caused it all to fall a bit flat. I love series books and A Texas Romance series is full of mystery, suspense, twist, turns, forgiveness, redemption and love. Hope Reborn finds the patriarch, Patrick Henry Buckmeyer, raising his family after the death of his beloved wife Sue after the birth of their son. We meet Millicent May Meriwether, a novelist of fictional romance books. She has traveled from New York to Texas to interview Levi Baylor and Wallace Rusk, Texas Rangers. What a shock to meet Henry Buckmeyer, and basically it is love at first site for both of them. Henry is a man of God and strong faith, he believes in the Bible and honoring God's word. May is agnostic, and scoffs at the fairy tales people insist upon believing about a deity in the sky that is all controlling. The story kept me captivated as Henry and May become friends and talk about the future. The dialogue is entertaining and heartwarming. I admired Henry for sticking to his principles and not becoming unequally yoked and sharing God's love and forgiveness with May in the most loving way. The Buckmeyer children and May develop a sweet and loving relationship and she loves them as a mother. The story does have a cliffhanger for the next book. Disclosure: I received a copy of this book in exchange for an honest review. All thougths, opinions and ratings are my own. I must confess I have a weakness for stories about Texas. I lived in the D/FW area for many years, and it still holds a huge piece of my heart. Caryl McAdoo writes a delightful story about Patrick “Henry” Buckmeyer, Texas Ranger extraordinaire and his family, and about an author of dime novels, May Meriwether. However, May has many secrets. Secrets she’d rather stay that way, but a certain Texas Ranger may “tickle” the truth out of her. One of my favorite characters was May’s friend Chester. Chester acts as chaperone, helper and friend to May. He also helps guide her through life, something she needs as a single woman in the 18800s. But the thing I enjoy most about Chester…he knows May better than she knows herself and can get in those little zingers that only someone who really knows and cares about you could or would be allowed to do. Hope Reborn has a very distinct and constant theme of Christianity and makes no apologies for it, either. Part of the storyline deals with the strong faith of many of the characters and the lack of faith on the part of an individual essential to the narrative. I appreciate McAdoo’s handling of the situation and its resolution. I enjoyed reading Hope Reborn and getting reacquainted with the Buckmeyers, Baylors and Wheelers. I have always relished reading stories that follow a family, or in this case families, and continue throughout several books. Caryl McAdoo wrote this story several years ago. I read it at the time, then read the others in the series. I had the chance to reread it and review it, so I jumped at the opportunity. May Meriwether decided long ago what life has in store for her but she soon gets a surprise when she travels to Texas. It was fun to watch as she struggles to keep those expectations the way she always known them to be. And then there is the secret. Chester is one of my favorite characters in the story. I like the way he looks out for May and cares for her. Patrick Henry Buckmeyer is another favorite character. Henry is a true Texan gentleman in every way and a hero that May soon finds almost irresistible. There is more than her closely guarded secret keeping them apart. I love the way Henry seeks God in all things, even in love and waits for His guidance and shares his faith with May. I appreciate the inspirational elements woven within the story-line and the strong faith that many of the characters have. Strong relatable characters, forgiveness, hope, love and faith bring this heartwarming story to life.